Home > Garden Plants > Magnolias already! Our mild winter has jump started some of our spring plants including Magnolia denduata ‘Swarthmore Sentinel’. This Yulan magnolia selected for its upright habit typically blooms at the end of March to early April. The creamy white blooms have been making an attractive display since last week. For a spring preview of the magnolia display (great eye candy), check out the latest Magnolia Society International Journal. Andrew Bunting, our curator, discusses how the American Public Garden Association is preserving germplasm and plant collections of magnolias with the North American Plant Collections Consortium. The magnolia collection at the Scott Arboretum is one of the most diverse of the collaborative. 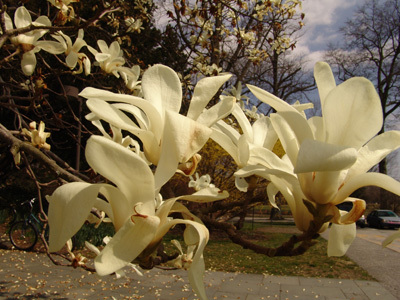 This spring we will also host a day devoted to magnolias: April 14. 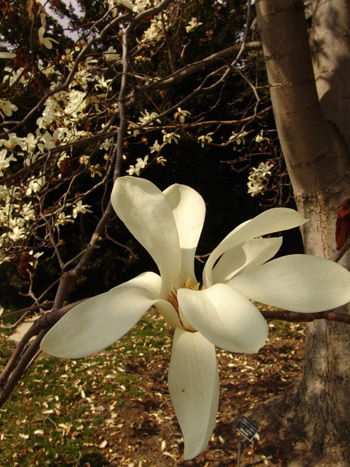 As president of the Magnolia Society International, Andrew will discuss magnolias for the home garden and lead an in-depth study of magnolia specimens. Although free, this event is limited to 40. Don’t worry, despite this early start to our magnolia season, a fair number of our collection will still be in bloom in mid-April. You must have read my mind. Just this morning, at about 7am, I was walking past this tree and saw it in full bloom. Wow, it sure seems early. Best of luck for a beautiful spring full of Scott Arboretum blooms. Thanks Rick. Lots of trees are now blooming with the strike of warm weather. ‘Swarthmore Sentinel’ sister Magnolia stillata ‘Royal Star’ is making a great showing along Chester Road too. 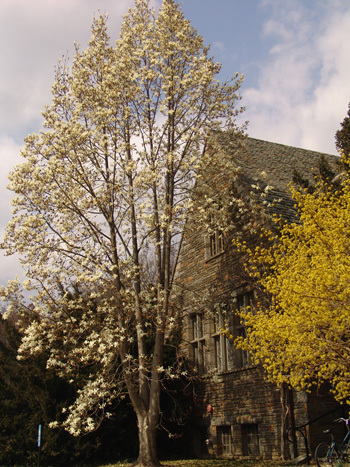 Did you catch the Prunus ‘Okame’ in full bloom over the Swarthmore College entrance rock? As of 3/20/12 the 50?f Growing Degree Day ( the standard measurement) was 72, last year it was 31 and 2010 was 61.